I decided to do a quick and dirty ISO verification of my Dragon last night, simple setup using a 500W Lowel Omni and a Macbeth chart. This is obviously tungsten only and I'll try to do a sunlight and HMI test as well but it may take a week or so. 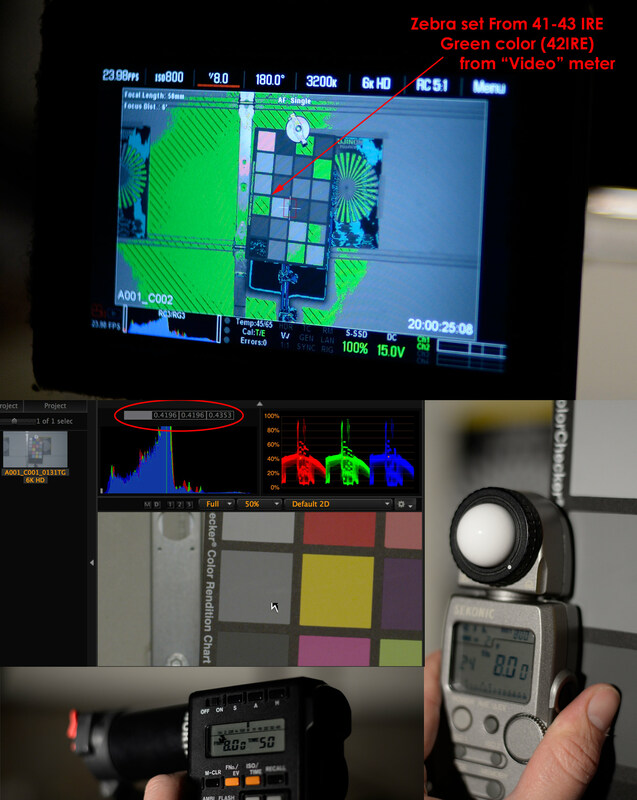 The 18% chip exposure was verified by a Sekonic incident and Minolta spot meters (see pic) as well as the "video" exposure mode and a Zebra set to 41-43 IRE. The frame grab was made in RC3/RG3 but was the same result in RLF. This is only a reference to 18% grey placement as it relates to the indicated ISO, all other tone placements above and below will be determined by the curve in use. thanks for the test! obviously much appreciated! I've often said that I think the standard Macbeth chart is worthless in an all-digital world. It had a meaning in a photochemical film lab, but not for digital. I much, much prefer a greyscale chart to a chart with random chips of color paints that have no bearing on modern-day camera chips. The DSC people are pretty sharp. I much, much prefer a greyscale chart to a chart with random chips of color paints that have no bearing on modern-day camera chips. I wasn't using the color chips, just the 18% grey chip. With the backup from both the incident and spot measurements I can say with certainty that chip is accurate. The rest of the chart is of limited use I agree, but it is a known quantity and that gives it some bearing as a reference outside the particular electro-optical system you may be testing. The truth is I couldn't find my 15 year old Kodak grey card and I'm not sure I'd trust it at this point anyway.